LAS VEGAS — It was a gold-medal rematch that lived up to its advance billing on Friday morning at the 2018 361° World Men’s Curling Championship, presented by Ford of Canada. 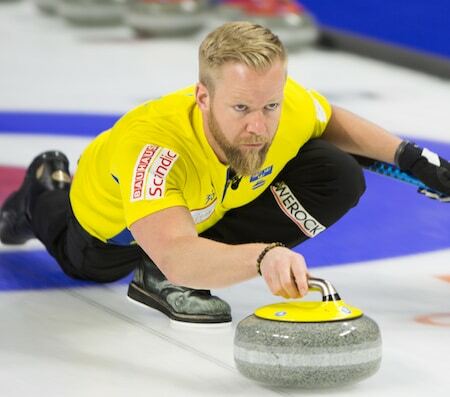 A year ago in Edmonton, Canada’s Brad Gushue capped an historic 13-0 run through the 2017 Ford World Men’s Championship by defeating Sweden’s Niklas Edin in the gold-medal game. Friday at Orleans Arena, it was Edin’s Swedish team coming out on top, with a thoroughly entertaining 6-5 victory over Team Gushue that wasn’t secured until Edin drew to the four-foot with his final delivery of the 10th end. With the win, Sweden improved to 10-1 and nailed down a bye directly to Saturday’s semifinals, while Canada dropped to 8-3 — guaranteed of third place in the 13-team round-robin standings and knowing it will play in Saturday morning’s quarter-final against the sixth-place finisher. 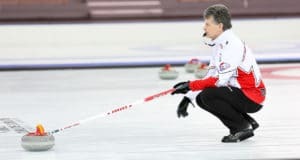 Edin took advantage of two first-end miscues from Canadian vice-skip Mark Nichols, making a runback double takeout to score three to open the game, and put Canada in a hole early on. Gushue, Nichols, second Brett Gallant, lead Geoff Walker, alternate Tom Sallows, team coach Jules Owchar and national coach Rick Lang didn’t fold their tents despite that crushing start. 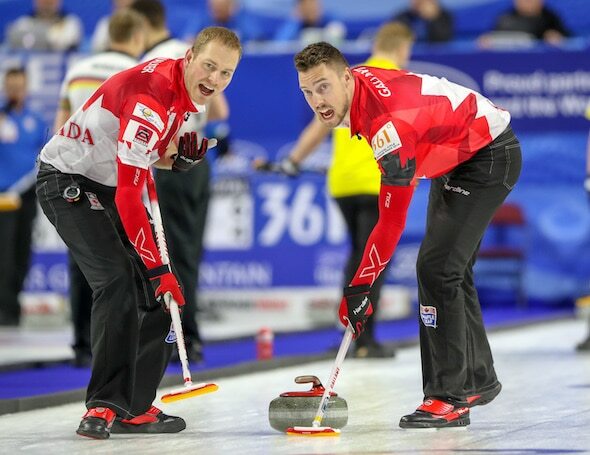 Canada kept digging and finally managed to pull back even in the game with a stolen deuce in the seventh end when Edin was wide on his double-takeout attempt. In the end, though, the Swedes managed to hang on for the victory. 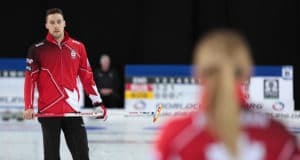 Canada will complete its round-robin schedule later Friday against Germany’s Alexander Baumann (1-10) at 9:30 p.m. (all times ET), looking to generate some momentum going into the playoffs. Round-robin play concludes Friday with the top six teams making the playoffs; no tiebreakers will be played, so ties for playoff spots will be broken based on head-to-head results, and if that doesn’t resolve the tie, then the pre-game Last-Shot Draw distances. The top two teams from round-robin play will be seeded directly into the semifinals (4:30 p.m. and 9:30 p.m. on Saturday), while third will play sixth and fourth will play fifth in the quarter-finals on Saturday morning at 11:30. In other Friday morning games, Italy’s Joel Retornaz (4-7) turned back Germany 11-4; Scotland’s Bruce Mouat (10-1) clinched the other bye to the semifinal with an 8-6 win over Switzerland’s Marc Pfister (6-5); and Rich Ruohonen (5-6) was a 7-4 winner over Dejia Zou of China (3-8). All of Canada’s 12 round-robin games are being broadcast by TSN. 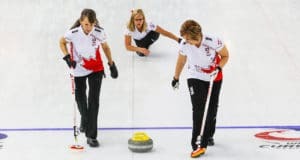 Go to www.tsn.ca/2017-18-curling-broadcast-schedule-1.593081 to see the broadcast schedule. Previous: 2018 U-18 Canadian Curling Championships begin Monday in Saint Andrews, N.B.